Trinity College Dublin, and Nadine Edwards, Pregnancy and Parents Centre, Edinburgh. In yesterday’s Herald, 10th September, Gordon Brown described how well Scotland’s NHS had supported him and his wife at the time of the tragic death of their baby daughter, in the Simpson Memorial Maternity Pavilion in Edinburgh Royal Infirmary in 2002. Gordon Brown and the Labour Party pressed ahead with Private Finance Initiative (PFI) deals for new hospitals, including the new Edinburgh Royal Infirmary. By 2002, the plans to sell off the old Edinburgh Royal Infirmary site to private developers and for a PFI consortia to build the new Infirmary in Little France had been signed off for four years. The first of these agreements is stamped 18 October 1998. This was before the Scotland Act came in to place in November 1998 setting up the Scottish Parliament. The development of a PFI hospital in Edinburgh was entirely a Labour project. It was Gordon Brown who in 1997 set up PFI Partnerships UK, a Treasury taskforce to organise handing over the control and financing of hospital building to the private sector. Brown, when interviewed in 2002 by Professor Allyson Pollock, the expert on NHS services, was asked why he wanted to use private financial interests for what were public investments, hospitals? Brown replied that the public sector was bad and inefficient at management, and that only the private sector could manage services well (see Allyson Pollock, NHS plc). The New Royal Infirmary PFI arrangement has absorbed between 12% and 14% of its local budget every year since it was built and this will continue for the next two decades. PFIs come at an extraordinarily high cost and a long-term debt burden for taxpayers (see Allyson Pollock’s How PFI is crippling the NHS). Labour may well have played a key role in creating the NHS, but since 1997 they have played an equally key role in ensuring it stops being run in the interests of the public, and becomes another way for their donors to make astounding profits. However to lie in an effort to change the future of your nation’s democratic direction is beneath contempt. …perhaps we should pity him? Not pity for him pity for those poor fools that believe him. It was astonishing to hear him claim that privatisation of the NHS was underway. It was sickening when he used a personal tragedy for cheap point scoring. That puts this man beyond the pale. this is the stuff of a hollywood drama when the corrupt city mayor uses all the dirty tactics and downright lies to get his way and hopes the compliant media backs him up then a honest reporter exposes him in our case we don’t have a honest reporter they have all been neutered this is government deception on an industrial scale and in their glee the other side fails to notice the fickle hand of the establishment can and will eventually be turned on them who will protect them then ? don’t look to us for help we are gone and you helped them extinguish us aren’t you clever now ! Andy Burnham,Unison and The Lancet saying one thing or Broon something different? Must see the writing is on the wall for his lucrative lecture tour if he is threatening to stand for office at Holyrood. Not so long since he referred to himself as a former politician (aka a Has Been) so he should just shuffle off into retirement and leave others to get on with it. The PFI for Edinburgh Royal Infirmary was first mooted in about 1995 under the Tories. They did the groundwork, Labour just continued with it. It currently costs NHS Lothian about £56 million a year. It will run for a further 25 years and at the end of that period it is not certain who will own the site or the equipment. Anent Broon’s personal tragedy, he omitted to mention his part in the illegal Iraq war which took the lives of tens of thousands of innocent children in that country. A hypocrite with no conscience, a human crocodile whose whole political career has been a damned tragedy. A key point – compassion for all children. Not once have those who engineered that war said sorry. How many died in that conflict, a conflict that has never ended in fact. Many have forgotten Jack Straw’s involvement in rendition flights through the UK and the refusal to accept reports of torture from embassies. Iraq and rendition flights – the modern Labour Party in action. 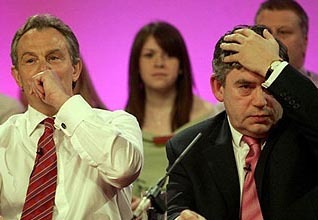 Gordon Brown: the “man” is contemptible. Coming from the Shetland Islands and having visited our fish market I’ve seen a very similar expression as Broons on a dead cod, in fact when the cod was alive it was more likely to tell the truth. How long do they think they can trade on this creating the NHS guff? This is a self congratularoy party with a huge sense of entitlement but their actions over-ride this. I don’t give a monkey’s who created the NHS. I care about how we are going to stop it being sold off. They simply don’t get it. We should not allow them to claim the glorious mantle of Labour. We need another Kinnock-style expulsion of all the neoliberals to allow us to rebuild Labour for the People. Yes indeed. The original values align with the common weal. The Labour supporters in Scotland still hold those values and are loyal to them. Unfortunately their leaders are not. I was employed by Balfour Beatty Capital Projects as the new Royal Infirmary at Little France was opened. The situation there is even worse than you think! As part of the contract Balfour Beatty Capital Projects run all the non-clinical services (Catering, Cleaning, Portering etc.). This was sub contracted to Haden Building Management, which is part of the Balfour Beatty Group. Do you think Balfour Beatty Capital Projects monitor Haden’s KPI performance fairly….? I resigned – because they were taking the cash for running services they clearly weren’t delivering. Because the hospital trust entered into the PFI deal with Balfour Beatty they cannot overtly criticise them because they would then be admitting the trust could be held accountable. This PFI contract in particular is a shocking deal for the tax payer. Reblogged this on Are We Really Better Together?. This is the same Gordon Brown who stated in the Red Paper for Scotland that if the Union of 1707 ceased to work for the benefit of the Scottish people, the union should be discarded, ie broken up. That is, an affirmation that if the Union acted against the working classes of Scotland we should go for Independence. The Union of 1707 has never worked for the benefit of the people in Scotland, esp in the last 40 years! Moreover, PFI is such a wonderful way of the government of the day off-loading cost away from their balance sheet and into the deep greedy pockets of the rich that we already owe over £300 billion in PFI thanks to Blair Brown and others. The slogan One for the Price of TWO is standard in the sales pitch. SChools and hospitals paid for by the public purse and the PEOPLE ripped off by these self dubbed SOCIALISTS! They have lumbered the people of SCotland England and Wales and NI with bills that will take decades to pay. In one instance, a building company invested only £1000 into the PFI deal and made a fast profit of £5 million!!!!!!!!!!!!!!!!!!!!!! Great Socialists do great socialist things for the greater good of the many dont they just! Nye Bevan and the Labour Gov of 1945-51 did build the NHS but Blair’s team of unprincipled snakes kept the Tory private policies going. The NHS is NOT SAFE in LABOUR HANDS! Gordon Brown and the rest of the Labour Party like to tell us how it was their party that created the National Health Service. That’s true. But what is equally true is the way the Blair and then Brown governments handed over millions of pounds worth of contracts to private companies under the Private Finance Initiative or PFI. Brown, who has recently been seen in Scotland in a desperate bid to save the Better Together campaign, is damaged goods. No one will ever trust him or his party again and it’s his and Blair’s fault. The Scottish Labour Party, too, is guilty because they refused to make a clean break with their English cousins. Johann Lamont, the party leader, has hopelessly tied herself to the same rotten neoliberal economic policies as Blair and Brown. A Yes vote is not only good for Scotland, it’s also good for British politics. Saor Alba! Bon Accord! Vive la revolution!